The mostly quiet rural roads of the Snoqualmie Valley were busy with hundreds of bicyclists riding the North Bend-based Tour de Peaks bike ride on Sunday. The bike ride features routes that criss-cross the Snoqualmie and Tolt river valleys. Above, cyclists pass each other on the Tolt River Bridge near Carnation. 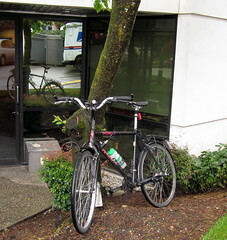 Here’s the special parking area set aside for bicyclists at the health clinic I visit for my annual check-up. Even though they’re in the business of improving health, they could certainly do more for those who try to maintain a healthy lifestyle by bicycling. During my visit, my doctor congratulated me on my low blood pressure and pulse, weight in the normal range, and strong-sounding heart — all results of regular exercise. Some people use bicycles for fun; some for transportation. Wounded warriors use bikes to get their lives back together. Through a series of short bicycle tours called Soldier Rides, veterans from the wars in Afghanistan and Iraq are learning to adapt to their life-changing injuries and get on with their lives. Yesterday I spoke with retired Army Lt. Col. Dan Schnock, the director of Soldier Ride who is in Washington DC preparing for this week’s ride that includes a spin to the White House to see the Commander in Chief. He had just spent the morning helping fit a double-amputee — he lost one leg above the knee, the other below — to a hand-cycle. ….